The Graduate Group in Cultural Studies was approved by the Office of the President on October 21, 1999 and began admitting students for the class that entered in Fall 2000. This was the beginning of a program that had been eagerly awaited by a number of units on campus that desired to have access to graduate education. Key departments and programs that were involved in the formation and early stages of Cultural Studies included African American and African Studies, American Studies, Anthropology, Art Studio, Art History, Asian American Studies, Chicano/a Studies, Comparative Literature, Critical Theory, Dramatic Art and Dance, English, French, German, History, Sociology, Textiles & Clothing, and Women & Gender Studies (with over sixty faculty stating an interest in fields linked to Cultural Studies). The Graduate Group is housed in the interdisciplinary programs in the Humanities, Arts, and Cultural Studies Division (HARCS) and receives a great deal of support from both the Dean of HARCS and the Dean of Graduate Studies and their staff. There are now approximately ninety faculty members in the graduate group drawn from twenty different Division of Humanities, Arts, and Cultural Studies and the Division of Social Sciences programs, two College of Agricultural and Environmental Sciences programs and departments as well as members from the School of Law and the School of Education. Cultural Studies is an interdisciplinary approach to the study of culture and society that responds to and builds upon, critical analyses of traditional disciplines and epistemologies as well as upon developments specific to gender, ethnic, and sexuality studies that have emerged over the last thirty years. Key to the Cultural Studies approach is the perception that language, gender, race, sexuality, nationality, and class organize identities, complex social relations and cultural objects. Also key is the assumption that the study of culture in all of its complexity requires cross-disciplinary work. Cultural Studies assumes that the object of knowledge will determine the methodologies to be used. It actively encourages the crossing of disciplinary boundaries and promotes the innovative interweaving of methodologies that have been traditionally associated with a wide range of disciplines. 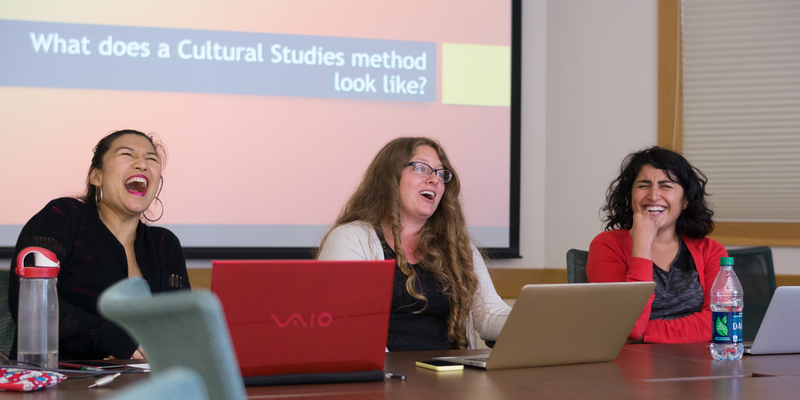 Cultural Studies flourishes within formations that facilitate communication and collaboration among scholars from diverse fields. Cultural Studies has emerged as a discrete field of inquiry over the last thirty years. "Culture," for example has long been an object of inquiry in Anthropology, Sociology, and the Arts, although these objects of study have seemed to have little in common or to be defined against each other. But a growing desire to broaden inquiries into “culture,” born of the complexity of contemporary life, the necessity of analyzing its operations, and the critical perspectives produced by the social and intellectual movements of the last few decades have converged to produce interdisciplinary research and teaching under the banner of Cultural Studies. As in most fields, scholars in Cultural Studies share many assumptions, concepts, and methodologies, but, as in traditional fields, there are different tendencies and emphases within Cultural Studies as a whole. Thus, the specific configuration of any Cultural Studies program will depend to a great degree on the interests and commitments of those involved. At UC Davis, the Graduate Group model offers the flexibility of allowing scholars in related disciplines to work together across departmental and disciplinary lines. The program’s strong foundation in feminist, anti-racist, and postcolonial studies provides links to numerous fields, methods, and research topics.